Purchased this based on excellent reviews and great price. Great value on a great handgun. Recommended and was a GREAT Deal. When I heard it was better than the 2.0 and better Accuracy then I decide to choose it. Recommended by a colleague. I tried out his M&P 9mm and really like it. Currently shooting a Glock G19 and need another gun for shooting with my wife. Great price, especially with rebate. I own the same pistol with 10k rounds and want a second. Great price and current manufacturer rebate. With a price that low and a $50 rebate on such a great gun I just couldn't pass it up. Shot one a friend had and the gun fits me perfectly. The rebate makes it even better. Great price for a good quality firearm. Great fit for both duty and off duty, the reputation of Smith and Wesson and the price. I am newer to shooting and so is my son. However, this is what seemed to get the best reviews for the money. Thanks Grabagun! i used this for my CW class and loved it. it holds 17+1, and did not kick bad at all. i am a petiet woman and i did fine with this. I Love this gun. Feels right in my hand and is very accurate. It's one that I wanted to add to my collection. I've seen good reviews on it which influenced my decision to make the purchase. Own Smith and Wesson products. Great weapons. Great reliability and performance. I am a retired police officer. I carried one on duty, this is a fine weapon. Best price around, plus rebates makes this a great deal! It's a reliable weapon and I like the clip capacity. Outstanding gun at a great price. Great gun, but the price and rebate make it a steal. Unbeatable price!!! Nowhere else comes close to GAB!!! Will this gun work with the m&p 9l ported 5" slide kit? BEST ANSWER: Yes it will, just installed one on mine and works flawlessly. Fast service, good pricing, can't wait till I am ready for my next purchase. This will be my 2nd one I owned. Very happy and pleased by this product. Also Grabagun was very prompt about shipping! Good company! Excellent hang again! Arrived in a timely fashion and was as advertised. Great price! Will definitely order again. This weapon is a great handgun with all the "extras" the 17 rounds make it a little heavy but great handling weapon. Company offer lifetime warranty against defects. AWESOME gun. Great price and value. I love this gun. It was a great price! It came with a case and two clips. I received my gun the next day. I couldn't be more pleased with my purchase and this company! I love it! Smooth and fits in your hand like a glove! 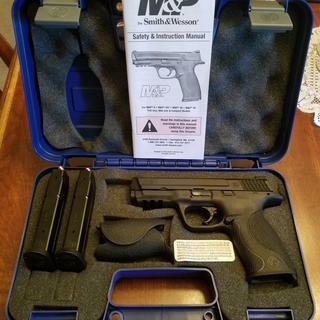 Thinking about buying the S&W M&P .45!! After all the hype about the 2.0 the original features, other than the trigger, are much better. Add an Apex trigger to this model and you have a much better gun. The re-design of the slide release makes it unusable. The addition of the extra rails is causing feeding malfunctions. The stippling on the backstraps is overly aggressive. New & improved isn't always so. A fine weapon for a very good price. works great and is a dynamo. Accessories make it even better. They are everywhere. I own this gun, and the .45. They're both really nice and accurate. They're are more top shelf 9mm's out there, but I am proud of my Smithy's. I trust them with my life. The hand grip is blatantly plastic more so than my Ruger SR9. SR9's grip is superior in term of quality,other than that,great gun. this is a quality handgun from a reputable company. what else can I say. I love it. Good gun. Approximately 150 rounds down range so far and only 1 malfunction which was my bad. Feels good in my hand. 3 backstraps make it easy to fit any hand. Grip is good not too aggressive but would benefit from Talon grips. GrabAGun processed my order promptly and kept me notified each step of the way. The price was good and the gun is great. This is a great gun for the price, i would recommend it for anyone looking for a reliable gun for a good price. I love my Glock but the accuracy of this gun is unbelievably great. Great gun for the money. I love this pistol. It shoots great and is very accurate. I own 3 S&W guns and love them all. 1000 rounds no issues. Happy customer!!! one fine weapon. could not be happier! Grab a gun was mgreat! Do not hesitate to purchase this pistol.. This was my first 9mm. Have two .40's from other manufacturers. Pistol points true, feels good in the hand and has had zero ftf or fte through about 750 rounds. Which were a combination of jhp and fmj. Fast shipping , excellent customer service and will absolutely but from Grab A Gun again. The staff was very helpful for my overall experience. The firearm came in and was in excellent condition. The price was great for the condition of the firearm. I would purchase another firearm from this website. Great starter handgun to have Fits just right in my hand for being a big guy with big hands. I have only put a few hundred rounds through my MP 9. Before shooting the gun, I changed the sights to night sights and mounted a high end tactical light laser combo to the rail. My first rounds fired were indoors at 30'. I was pleased with how easy it was to zero in and I used a bench block to steady each round as I zeroed. Both the night sights and laser were locked on before firing a single shot. The gun feels really good in my hand with, or without a shooting Glove. The Trigger pull needed some tweaking but other than that the S&W MP 9m high capacity mag hand gun is one heck of a buy. I also have the MP 2 in 40 cal. Both are very good weapon's to own for self defense. I deal with a very good gun dealer in Ash Flat, AR, however he was unable to even closely match the price from Grabagun. I ordered this pistol for duty purposes on 11/19/2017 and received it on 11/22/2017. Unbelievable shipping turnaround. I should have waited three days, as the price dropped $30.00 in those days. Otherwise the purchase was flawless and at a great price. After buying my M&P 9 Shield through Grabagun it only made sense to go to them for another terrific firearm. The M&P 9 is a rock'n pistol, well built and dead on accurate as well as a lot of fun to shoot. With top-shelf design and performance matching their S&W pedigree, it's everything I've been looking for in a solid range shooter and defensive sidearm. The Shield will remain my primary carry piece but I have no problem trusting the M&P 9 in a carry role, a bit bigger than the shield but still compact enough. And Grabagun? This is my 3d purchase through them, they're local so I get the chance to stop by in person and I honestly enjoyed the experience. A great vendor with a terrific team who are all really knowledgeable and fun to deal with. Terrific weapon. The minute I pick it up it fit my hand like a glove. This pistol had the best feel of any handgun I have ever owned. The better it feels in your hands the better you will shoot with it. A top pistol for home defense or to keep at your business for protection of yourself and your employees. Excellent for plinking on weekends too. This is an excellent and high-quality handgun. It just feels right in your hand. Perfect for home defense, business protection, and personal defense. There was a problem with the invoice and Gab a Gun straightened it out within an hour. Thanks, Grab a Gun! I can't say enough about this gun. I have probably 1000+ rounds through it, no FTF or jams. Super accurate and durable, I did get the model with the 5.25" barrel though. Fits my hand perfectly (I have medium hands). The mag ejects with enough force that it'll drop out even if you have the gun tilted up. The only negative I have for this gun is the trigger. I would definitely recommend upgrading it. The sights are above average way better than the glock but nothing special. Overall accurate and durable. One of the best companies I've ordered from. Amazing service and shipping. I ordered on Friday before Memorial day weekend and picked it up at my FFL Tuesday. I received shipping confirmation 30 min. after I placed the order. Great company and great prices. The gun is a S&W. Enough said. It was very easy for me to order my new M&P9 online through Grabagun! The transaction was smooth with lighting fast shipping! Thank you! Good gun well made good shooter I find it's a better shooter than the 9cLike the quality of smith overall and the m&P just feels good in the hand. Excellent price, especially with the current S&W promotion of 3 free magazines. Gun arrived to my ffl in a day and a half and was in perfect condition. I can't say enough good things about this transaction. The best shopping experience I've had from ANY online retailer... Gun was typical excellent S&W quality. Fit and finish is great. Can't wait to hit the range! I've always been a Glock guy, but am starting to like the M&P more.This site also has some of the best prices, and fast shipping. Will continue to spend my money here. Great business to deal with. Excellent prices and fast delivery. Received gun 3 days after placing the order. Immediately put 200 rounds through the gun without a hiccup. Smooth gun to shoot. Not the best trigger but definitely not bad. No regrets at all. Well worth the price. Will definitely buy from and recommend Grabagun again. Ordered on saturday 2/21, shipped out on monday 2/23, could have had it as early as tuesday 2/24 if my FFL (here in OH) was open. Nice upgrade to the Ruger P95 it replaced and a nice compliment to my S&W shield. Will buy from grabagun again. I ordered this on a Monday and had it in my hands that Friday. Shoots and feels great. Will definitely be buying from this site again.